Thought we needed a little cheering up this Friday so here’s a little ditty that my music teacher, Jean, introduced me to. It’s “Crazy Words, Crazy Tune” by Frank Crumit, from 1927, lamenting the popularity of the ukulele. 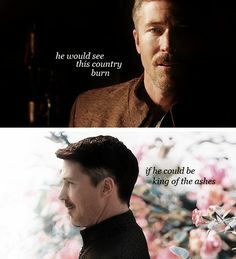 I think that Varys’s description of Petyr “Littlefinger” Baelish pretty much sums up my opinion of Donald Trump’s presidential aspirations. Text reads: he would see this country burn if he could be king of the ashes.